This is one of my Coast Guard pictures that I took, while aboard the USCGC Halfmoon. 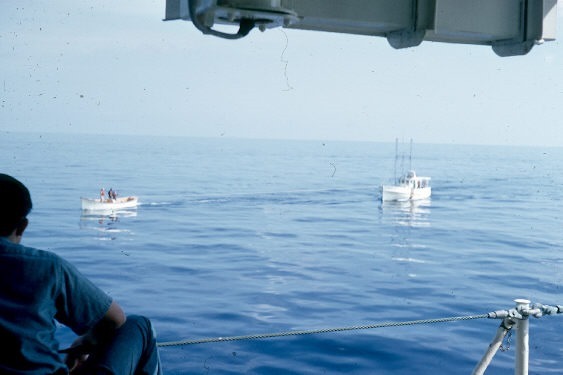 We were on patrol in the Florida Straits this January 1967 as we would be on our way to GITMO to play games with the Navy. I had just come “on watch”, 12 Jan 1967, when I heard “May-Day, May-Day” with words we would hear today, “shots fired”. The photo I took that morning as one of our Life Boards, with a “boarding party” escorted the Bahama Mama to our port side for further investigation. Later in the day, the FBI and others would be arrive and we all would head into Miami. I bring this up today, as I just found the Newspaper article that talks about this event. Star-Gazette, 12 Jan 1967, Thu, Other Editions, Page 3 — Newspaper.com. I remember the when we got home, my mother had a newspaper article, from her local newspaper, pinned to the Map she had with my adventures on the Halfmoon. She also mentioned that we were on the Philadelphia TV Station news for that day. Have found several other articles while searching through the Newspaper.com website about the family. This entry was posted on Saturday, November 17th, 2018 at 9:39 pm and is filed under Military. You can follow any responses to this entry through the RSS 2.0 feed. You can leave a response, or trackback from your own site.